There’s a good chance that visitors to your site these days will be using a smartphone. We feel it’s important to provide them with a great reading experience while on the small screen, so today we’re announcing a new mobile theme: ‘Minileven’. Minileven is based on the popular and beautiful theme Twenty Eleven, with a lot of tweaks to optimize it for mobile screens. It will use the header image, background and widgets from your current theme for a great custom look. 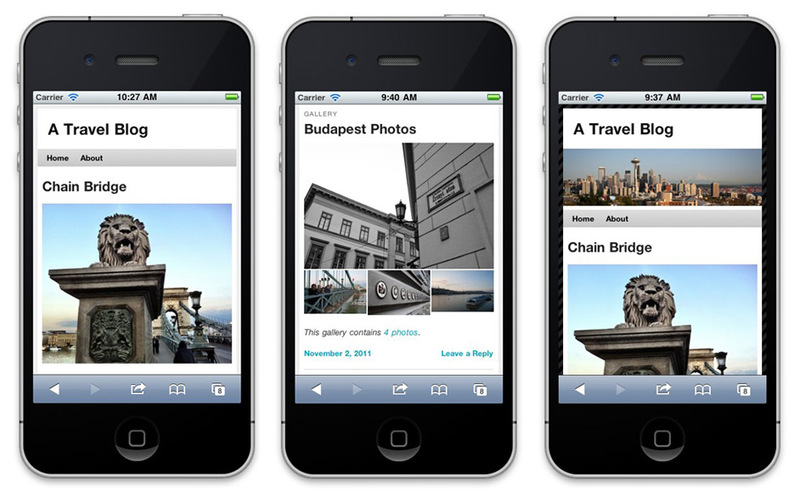 Post format support is included so your photos and galleries will look fantastic on a smartphone. We will continue to improve on Minileven in the future. What else would you like to have in a mobile theme? Learn more about getting mobile with WordPress. It’s great that there’s an option to have a mobile theme but is there any way of viewing how it looks from the dashboard without having to go to my mobile device? That’s a good idea, but a bit of a technical challenge to implement. Look forward to seeing my sites looking prettier on mobiles now! The older mobile version was good anyway in terms of functionality, but it’s nice to have a nicer-looking one now. Thanks! So JUST TODAY I had a subscriber send me a private email asking if I could possibly adapt my blog to make it easier to read on a smartphone Seriously. Hi and thanks for sharing with us the Minileven theme, i’ll surely install it. I think it is a late anouncement. I’m a regular mobile user of WordPress.com and I was seeing it for couple of last days. It is beautiful theme. Easy to navigate, readable and clean. The best thing is that it shows Widgets too. Only navigation-menu is the weak point of it , which shows Pages instead of custom menu!! Took a look and WOW. AMazing. Now visitors don’t have to click through to see the starting image I post for each article. SWEEET. The white background is nice. Somehow seems more airy than the old theme. I like it and it really makes the mobile experience an “experience” as opposed to a series of hurdles to try and enjoy something. But the main PITA of the old these is still there. You have to click & wait just to see people’s comments. Why! I just now looked at the four blog sites that I manage for my clients. In general they look nice on my Droid. Two problems though. 1 – The entire screen on a smartphone scrolls, not just the text area. So, backgrounds that are fixed on a computer are no longer fixed on a smartphone. That means that when a person scrolls down for a bit on their smartphone, the background ends and there’s only a solid color which is not brand-aligned. 2 – 3 out of the 4 blogs I reviewed don’t show Pages/Tabs anywhere on the smartphone screen. They show up as Pages/Tabs on the top of the computer-version layout, just not visible anywhere on a smartphone screen. How did you come up with the name? Leven = Life in Dutch. What can I say, people are already visiting my blog on their mobile. Thank you for bringing Minil11 🙂 Happy November. Can we dynamically change the use of themes for mobile device & desktop browser? It seems that this is exactly what I am looking for right now for my website. Nice. Looking forward to more mobile-optimized themes. Any chance of having it for .org sites? Great theme. Now only if we had a mobile dashboard… Just hoping. Its not always feasible to download and use the app. A mobile web dashboard would be great. Cheers. There seems to be a problem. When I look at my blog using my mobile (iPhone), the photos are all shrunk in horizontal orientation. Do we have the option to choose the old mobile theme? I think it works pretty well. Cheers! This has been fixed, thanks for letting us know! After being at a conference yesterday and seeing the number of smart phone users (including me, still wet behind the ears), I don’t really know if the figures for feature phone users outside the US is still as high as it was even a year ago. I’m assuming that the WPTouch theme introduced in 2009 is still displayed on those phones. Mobile rocks! I don’t see Minileven option anywhere – looked in new Themes and plug-ins. We have our own hosted blog and a (currently hidden) WordPress.com blog. any chance to have available for Blackberry?? The newer BlackBerry browsers might support Minileven. We will research this and perhaps release it for those devices. Great work! I take it that was one of the projects the Automattic team worked on last week in Budapest? I can’t wait to see the other ones! sorry i havent understand it… this is a theme that exists on the theme gallery so you can pick it up OR Minileven is an option on the Mobile section at the wordpress Appearance panel? If you enable the mobile theme in the Mobile settings, Minileven will be shown for your site when someone visits from a smartphone. i am unhappy about this theme. 1. Takes a lot of time to load with images (an issue on slower GPRS networks here in Europe). 2. Also it doesn’t respect my settings: I choose to have 1 post on main page and this theme displays 5, with no way to overrule this. 3. Also I much preferred to have excerpts rather than full post, as in the former mobile theme. 4. In the former mobile theme comment counter was on top near the post title, now it’s hidden at the bottom, while with animated discussions readers are interested to see how many new comments are there. PLEASE give option to customise new Mineleven theme or give choice of former mobile theme. hmmm….this is good? because i am checking all my blogs on mobile and at the footer says: wptouch, so now if i am going to see my blog on a mobile wptouch would be removed and minileven will show up? i mean, minileven came to replace the wptouch mobile friendly view when you see a blog on wordpress.com on a mobile? WPtouch has been replaced with Minileven, yup. There’s a link in the footer of Minileven, ‘View Full Site’ that will take you to the regular theme for the blog. I didn’t know it was released today until I checked my site on my Android device. Neatly done and clean! That’s really a good start on welcoming more visitor using mobile devices! Keep it up! @Dan: No worries, thanks for the response and least it answers the question! Keep up the good work! Hmm, this sounds like a good compliment to my Twenty-Eleven theme. Keep up the good work, but I ask you – if WordPress.org provides a Twenty-Twelve Theme, will there be a minitwelve theme on WP.com? I prefer the older version of mobile theme since I have pretty long post for each one. If you don’t want to give me the option to choose, at least give me back the share button for facebook and twitter! Please! I just checked it on my Android and it’s fantastic. The old one was functional but this new look is bootylicious. Well done guys. This new theme is awful. Why change something (ie WPtouch) that’s worked so well?! It’s actually what made me switch from TypePad to you guys! It’s definitely cleaner than this new disaster you implemented. I’m very disappointed since the new theme looks and feels like a huge step backward. My blog is practically broken on it and the perfoamce is worse since it includes full posts on initial render. Please give me the option to keep WPtouch. Or refund my $99 and I’ll move my blog to Tumblr. We’re going to add improvements to the theme from here on and are currently looking in to adding an option to just show post excerpts on the homepage for a performance improvement if desired. What is looking broken on your blog? It’s probably just some style fixes that need to be added on our side. Doesn’t look too bad, but from what I am reading, we pretty much aren’t getting a choice of mobile themes? What if we want to stick with WPTouch? We should have the option of choosing our mobile theme, just like how we have the option of choosing our main theme. Any chance the Minileven code can be made public so we can use it on WordPress.org (self-hosted) blogs? I have a plugin now, but Minileven is much cooler! It’s used for quite specific WordPress.com stuff, and wouldn’t really work well if we released it as a plugin. You’re more than welcome to use the CSS file though, which is the main difference between Minileven and Twenty Eleven. I dont understand why you dont offer a special mobile theme instead. Like a user said before, I would like to have my custom menu instead of the pages. And I would like to see what it looks like on my computer as well, not just on a smartphone. Thanks, we are looking at improving the theme continuously and will consider adding custom menu support. We’re discussing options for low bandwidth usage, perhaps an option to only show the post excerpts on the homepage. Hmmm, seems like this new mobile theme doesn’t fit the somewhat smaller screensize of my (lower-range) android phone. Text adjusts itself okay, but images and header for instance are to wide. The size is perfect for browsing in landscape-mode though, in portrait it is too wide. On the contrary, if I view my blog as full-site everything is scaled perfectly. Header, images, … everything is displayed very nice + it adjusts very well when zooming. So the full site version works better then the mobile one on my phone. PS: I was just testing and my wife’s blog doesn’t have this problem (bestamped.wordpress.com). If I view her blog on my phone the mobile theme scales everthing nicely. Strange. Very disappointed in this new theme. Gone are the menu and share buttons. And when I clicked to view full site I now cannot find a link to go back to mobile. I’d like the option to return to the old theme please. This was a big step backward. After clicking to the view the full site, there will be a ‘View Mobile Site’ link in the footer at the bottom. Sharing Buttons are not showing on this theme, as those were shown on WPTouch in past. Awesome! I was wondering why my blog looked different on my phone. Good job! This is great! My only gripe is I have the background fixed on my blog but on the mobile version it scrolls. I would like it fixed on both because the scrolling away to no background further down looks messy. Can this be fixed? I would like to have the option of using the old mobile theme (WPtouch?). It was more of a real mobile theme instead of the shrunk down version of the full site. Having the option for either the new or old theme would be nice. Thank you. I love it! I check my blog from my phone often, and noticed the change a few days ago. It looks great! Preferred the old version. The large amount of scrolling through each post is a PITA. If it did auto-excerpts that might work. But mass scrolling through (long) posts is a real shame and misses the point of a mobile theme IMO. A case of one step forward and two steps back it seems. Regrettable.